LIVESTREAM for the Opening Up Digital Fiction Writing Competition Prize Night! Can’t make it to the Prize Night? Watch the proceedings live online! Broadcast starts at 7pm GMT, Thursday 25 May 2017. Last autumn we gathered 19 participants into our CI Lyle Skains’ office (one at a time, of course!) to study how they approach and process hyperlinks in a digital fiction story (Skains’s The Futographer, a bit abridged and anonymized). We wanted to know how they chose which links to follow, what expectations they had for the links’ destinations, and how they responded when those expectations were either met or denied. Isabelle (the project Researcher) sat patiently with them, pausing at various points to ask questions designed to dig into their cognitive processing and readerly navigation tactics, and recorded all responses. It’s taken some time to transcribe and review that data, and we’re really only just getting started. Last night we invited all of the participants (and interested research students at Bangor University) for an evening of discussion about our initial impressions of the data, how we designed the study, and how hypertexts work for readers and writers alike. Lyle began with an overview of the purpose of our research, discussed the current scholarly discourse on the use of hyperlinks in digital fiction, and then described our typology of hyperlinks. Isabelle gave more details on the protocol we designed for the study. We had a look at the interview questions and the demographics survey, discussing what information we hoped to get out of the various questions; an interesting discussion ensued about the different methodological approaches available for a study of this nature. We showed them some selected quotes from the anonymized participant transcriptions, showing early indications of typical responses to the four different types of links we were looking at. Some interesting trends have already emerged from the transcriptions, including reader purpose, identification with character, and expectations based on narrative schemas. Participants also picked up on some of our initial thoughts about the use of particular narrative perspectives (The Futographer uses a second-person point of view), launching a discussion on point-of-view, character identification, likeable vs. unlikeable characters, and reader-identification with moral choices in the narrative. Overall, we enjoyed a particularly lively discussion of the results, as well as questions about creation of the hypertext and its story. Despite being scheduled for an hour, we bounced ideas and questions around for nearly three times that long. For an evening with such a dry title (“dissemination” is so medical! ), the keen interest from the participants turned it into an insightful and stimulating discussion. Shortlist Announced – Voting Open for People’s Choice! We received over 100 entries for our Opening Up Digital Fiction Competition from all over the world, and we’ve been so excited by the quality of the submissions. It’s been hard work for the judges to narrow down the list, but we’ve finally done it! The shortlist is available here – we invite everyone to review the shortlisted entries, and to vote for your favourites. Voting is open until 20th May 2017; winners will be announced at our prize-giving event in Bangor, Wales on 25th May 2017. The shortlisted works will only be hosted on our site for the voting period. Please share with friends, family, and colleagues. We want everyone to be able to read these excellent works of digital fiction, and to vote! We split the kids into five groups of five, each table with an adult to guide them. Isabelle introduced the first activity, and we got underway. Each group had one line of a story about a monster (inspired by the digital text for the day), and they read the line, tried to figure out the whole story from the one line, and used colored pencils to draw the story. I (Lyle, that is) am fairly certain my table was at a disadvantage with me at the helm, as it seemed to take me longer to coax them into drawing things (who would have predicted kids would be reluctant to draw!). But once they got into it, they went to town, creating several of their own monsters — Jeff, Jake, Jac, Jac, and two horses named Aranchow and Jessica — and their mice friends named Bob and Jake (clearly, we were in need of a naming book of some sort!). The tables shared stories and drawings with one another, and then volunteers from each table took their “lines” to the front of the room, and we all helped put them in the order of a story. Then it was time to break out the iPads, much to the kids’ excitement. We launched the apps for them (Busy Bee Studios’ Even Monsters Get Sick), and they paired up to explore the story of Harry and Zub. The gameplay seemed to be what really drew them, as they took turns playing parts of the story over and over. Once they’d been through the text several times, they finally settled and were just getting into the story when our time with them was over. Our digitally literate year 1 students! It was a highly successful workshop, and the class was very enthusiastic and exceedingly well-mannered. The students engaged in every activity, jumped right into the digital story, and brought in other experiences they related to it (such as the Gruffalo and Minecraft — some clearly have tablets at home!). It was fascinating to see what they were drawn to at this age, just on the cusp of literacy (they could all read their cards, but needed a little help here and there). Given a screen’s worth of both text and interactive content, they exhausted the interactive content before engaging with the narrative. Once the games were finished, however, they were just as excited to experience the story. Perhaps there’s something there about engagement, immersion, pleasure, and instant vs. delayed gratification. At any rate, we had an excellent experience, and we hope to be able to repeat it. Our thanks goes out to Rhodri Morgan, Owen Llywelyn and the National Library of Wales for facilitating the workshop, and to Lucy Davies at Ysgol Llwyn yr Eos for hauling her students to the NLW for the session. Thanks also to Isabelle for all her hard work contacting schools and preparing the workshop — all that effort definitely paid off! Announcing the date and location for the Opening Up Digital Fiction Writing Competition prize-giving. Winners will be announced and prizes awarded. This should be a great chance for writers, researchers, and readers to get together to celebrate the digital fiction that was submitted, so please add it to your calendars! 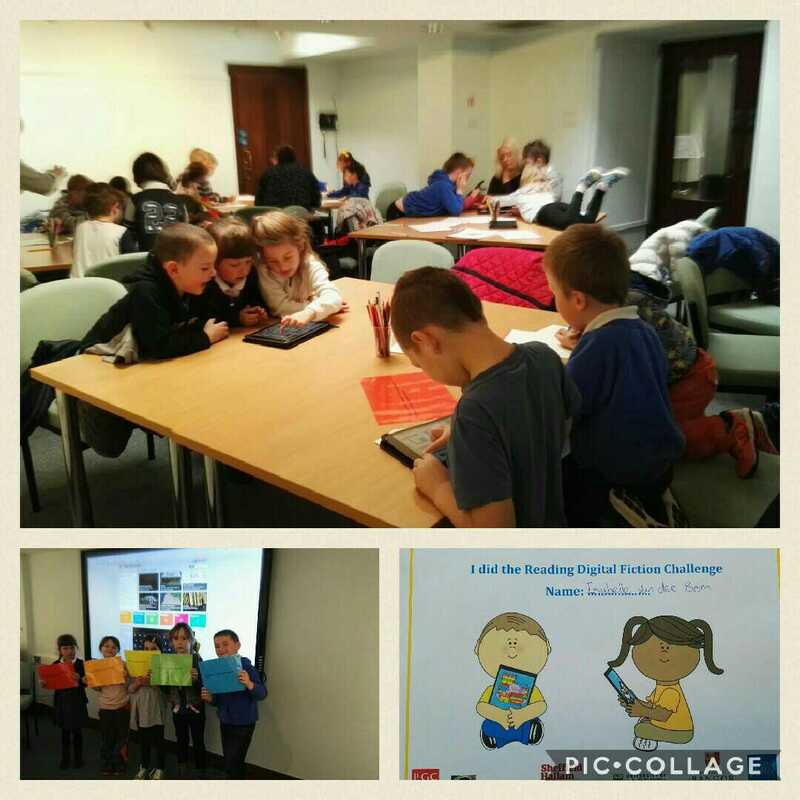 A few weeks ago, the Off the Shelf Reading & Writing Digital Fiction Workshop we organised with Andy Campbell and Judi Alston from Dreaming Methods and One to One Development Trust took place. Project Researcher, Dr Isabelle van der Bom, provided an overview of what digital fiction is and how it has developed through the ages. Andy then introduced the ten participants to a variety of digital fiction works and software by giving an overview of his pieces, how they were developed, and by showing different software packages. Andy Campbell talking about developing WALLPAPER. Participants were also introduced to Twine, an open-source tool for telling interactive, nonlinear stories. Twine allows writers to embed hyperlinks in their story, which means that readers will need to navigate through the text by clicking these hyperlinks. Twine can be downloaded (for free), or you can use the online version (remember to archive the story if you want to save it). To get going with Twine, all you need to know are a few very basic rules, such as how make links between passages, and you can create very elaborate stories. We certainly were amazed at the variety of ideas that our workshop participants had, and how they implemented these in Twine! Andy explaining Coppercube to a workshop participant. Andy and Judi had made a wonderful Twine story and database based on their own immersive narrative game WALLPAPER, which participants could use in their own story creation. It was a real learning experience for us, and very interesting to find out that participants had come to the workshop for a whole variety of different reasons. Some people contemplated the meaning of digital fiction and how it altered the writer/reader/fiction relationship, others had a background in IT or design. Yet others had ideas about creating virtual memory maps for eldery residents in care homes or were just interested in trying something new. We had a great time and we hope that our participants did too! We are pleased to announce that the Off the Shelf Reading & Writing Digital Fiction Workshop that had to be rescheduled in October due to unforeseen sudden circumstances will now take place on Saturday the 21 January 2017 from 2pm-4pm. This masterclass will provide a two-hour workshop on reading and writing digital fiction by digital media artists/writers Andy Campbell and Judi Alston of One to One Development Trust with Dr Isabelle van der Bom. We will begin with a short introduction to digital fiction stories, followed by an exploration of how digital storytelling is different from writing forthe traditional print medium. Participants will then be introduced to digital writing software and get the opportunity to write somethemselves. The workshop will conclude with a short exposition of what has been achieved. No prior knowledge of digital fiction required! Organised by Sheffield Hallam University in association with One to One Development Trust. Charles Street building 12.3.10, Sheffield Hallam, S1 4RB. Admission free but booking advisable. To book: Eventbrite Booking – Reading & Writing Digital Fiction Workshop. Email for questions to Isabelle at i.v.bom@shu.ac.uk. Organised by http://dreamingmethods.com/ and https://readingdigitalfiction.com/. We are very excited about the upcoming WALLPAPER: hope, fear and digital fiction events, part of the Being Human Festival 2016. We’re kicking off on the 17th of November, when you can join us for the WALLPAPER launch at the Art House in Wakefield. WALLPAPER is an immersive digital fiction work which will be exhibited as a large scale projection and virtual reality experience. As the reader/player of WALLPAPER, your task is to explore the house as PJ Sanders to find the missing key to the parlour, a room locked until now. By moving through the house and examining forgotten heirlooms and personal artefacts, you slowly reveal the story of PJ and a family history of unfulfilled hopes and hidden fears. WALLPAPER provides an immersive digital experience, and on the 17th you’ll also have a chance to meet us and digital fiction developers Andy Campbell and Judi Alston (Dreaming Methods– One to One Development Trust). The installation of WALLPAPER is also open on the 22nd and 25th of November. On the 23rd of November we’ll host a interactive talk at the Wakefield Art House, in which we will explore the origins and future of digital fiction, including the hopes and fears that digital technology bring to the future of reading and writing. We will take you on a historical tour of digital fiction from its origins in ‘Choose-Your-Own-Adventure books’ through to experiments in hypertext to videogames and apps and invite you to discuss your ideas. Afterwards, attendees are invited to join Andy Campbell and Judi Alston’s exploration of hope and fear in their latest work WALLPAPER. Please join us by booking yourself onto on of our free Being Human ’16 events here: Being Human Events in Yorkshire and the Humber.